Liverpool squandered a three-goal lead in the final 11 minutes at Crystal Palace to see their Premier League title hopes suffer a severe blow - and leave Luis Suarez in tears at the final whistle. Brendan Rodgers's side looked to be maintaining the pressure on title favourites Manchester City, and reducing a gap in goal difference that remains at nine. Joe Allen's first league goal for Liverpool and strikes from Daniel Sturridge and Suarez put the Reds in complete command as the visiting fans urged their side forward in search of more goals, with City in their sights. Instead, their fragile defence collapsed completely at the first sign of serious pressure as Palace sent Selhurst Park wild with goals from Damien Delaney and a double from substitute Dwight Gayle. Liverpool's point put them back on top of the table, but the sight of players on their haunches and an emotional Suarez - his face covered by his shirt as he was ushered towards the tunnel by captain Steven Gerrard and substitute Kolo Toure - told the tale. Manchester City are now in pole position to win the title, with home games against Aston Villa and West Ham United to come. Rodgers will be at a loss to explain how his team crumbled so badly to squander the chance to move closer to their first title in 24 years. Palace have proved their quality against illustrious opposition before this season, but here they made a tame start and allowed the visitors to take the early initiative. Liverpool had a clear penalty appeal rejected early on when Yannick Bolasie missed his kick completely in the area and only connected with Glen Johnson. "Never has going top of the Premier League with one game to play been greeted by such an outpouring of grief, despair and disappointment." Referee Mark Clattenburg only awarded a corner, and Liverpool were frustrated once more when Mamadou Sakho headed Gerrard's kick off target when completely unmarked. Johnson was causing problems down Palace's left flank, and he should have put Liverpool ahead when he found himself clear on the end of Allen's raking long pass, but his header beat home keeper Julian Speroni and the bar. Liverpool's threat was growing and it was no surprise when they finally went ahead after 18 minutes. Allen pulled away from marker Joe Ledley to meet Gerrard's corner with space and time to head past Speroni. Palace finally showed more ambition as half-time approached, and Liverpool keeper Simon Mignolet was called into action to save from Jason Puncheon and Mile Jedinak. Any hope of a recovery seemed to be swept away by Liverpool's dazzling start to the second half that, at that stage, looked to have put the game out of Palace's reach and ate into City's superior goal difference. Sturridge saw his curling shot superbly turned on to the post by Speroni, only for Suarez to blaze the rebound wildly off target with the keeper still trying to recover his position. Speroni had no such luck moments later when Sturridge's low shot from the edge of the area took a crucial deflection and trickled out of his reach. Liverpool, sensing there were more goals to be had, surged forward and Suarez made it three with his 31st Premier League goal of the season when he beat Speroni easily after a neat exchange with Raheem Sterling. Palace had shown little but were revived 11 minutes from time when Delaney's 25-yard shot was deflected high beyond Mignolet. Liverpool suddenly seemed gripped by panic and Palace exposed them ruthlessly two minutes later as Bolasie squared for Gayle to score with a precise finish. And then, with two minutes left, the visitors' misery was complete as substitute Glenn Murray chested a long ball into Gayle's path for another comprehensive finish. As Palace players celebrated, Liverpool's reacted in a manner which suggested they believe their title challenge is finally over. 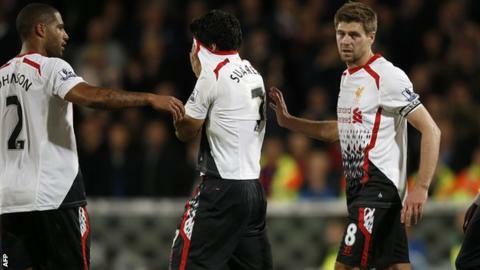 Match ends, Crystal Palace 3, Liverpool 3. Second Half ends, Crystal Palace 3, Liverpool 3. Attempt blocked. Lucas Leiva (Liverpool) right footed shot from the right side of the six yard box is blocked. Assisted by Victor Moses. Corner, Liverpool. Conceded by Damien Delaney. Corner, Liverpool. Conceded by Thomas Ince. Attempt missed. Dwight Gayle (Crystal Palace) left footed shot from outside the box is close, but misses to the right. Assisted by Glenn Murray with a headed pass. Attempt saved. Philippe Coutinho (Liverpool) right footed shot from the left side of the box is saved in the centre of the goal. Assisted by Luis Suarez. Goal! Crystal Palace 3, Liverpool 3. Dwight Gayle (Crystal Palace) left footed shot from the centre of the box to the bottom left corner. Assisted by Glenn Murray with a through ball. Substitution, Liverpool. Victor Moses replaces Daniel Sturridge. Corner, Crystal Palace. Conceded by Luis Suarez. Attempt blocked. Glenn Murray (Crystal Palace) header from the centre of the box is blocked. Assisted by Thomas Ince with a cross. Substitution, Crystal Palace. Thomas Ince replaces Kagisho Dikgacoi. Hand ball by Luis Suarez (Liverpool). Corner, Crystal Palace. Conceded by Martin Skrtel. Goal! Crystal Palace 2, Liverpool 3. Dwight Gayle (Crystal Palace) right footed shot from the centre of the box to the bottom right corner. Assisted by Yannick Bolasie following a fast break. Attempt blocked. Joe Allen (Liverpool) left footed shot from outside the box is blocked. Assisted by Martin Skrtel. Attempt saved. Philippe Coutinho (Liverpool) right footed shot from the centre of the box is saved in the top centre of the goal. Assisted by Joe Allen. Goal! Crystal Palace 1, Liverpool 3. Damien Delaney (Crystal Palace) left footed shot from outside the box to the top left corner. Assisted by Mile Jedinak. Substitution, Liverpool. Philippe Coutinho replaces Raheem Sterling. Mile Jedinak (Crystal Palace) wins a free kick on the right wing. Attempt missed. Glenn Murray (Crystal Palace) right footed shot from outside the box is close, but misses to the right. Assisted by Joe Ledley. Attempt blocked. Raheem Sterling (Liverpool) left footed shot from the left side of the box is blocked. Assisted by Joe Allen. Attempt blocked. Raheem Sterling (Liverpool) right footed shot from the centre of the box is blocked. Assisted by Daniel Sturridge. Attempt missed. Martin Skrtel (Liverpool) header from the centre of the box misses to the right. Assisted by Steven Gerrard with a cross following a corner. Scott Dann (Crystal Palace) is shown the yellow card. Attempt saved. Glen Johnson (Liverpool) left footed shot from outside the box is saved in the top centre of the goal. Substitution, Crystal Palace. Dwight Gayle replaces Jason Puncheon. Corner, Crystal Palace. Conceded by Glen Johnson. Martin Skrtel (Liverpool) is shown the yellow card. Marouane Chamakh (Crystal Palace) wins a free kick on the left wing.